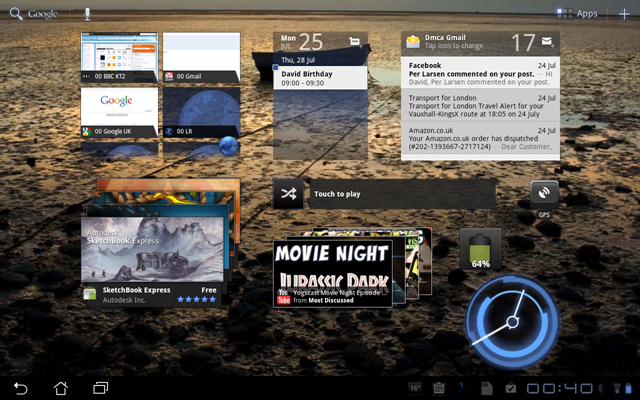 In prior posts I have covered the core browsing software for Android tablets as well as the soft and hard keyboards. In this post I will round things up by looking at the other software that I use on a day to day basis. I’ll continue to compare these apps to those available on the iPad, to finish answering the question of whether you are really buying a second best offering with the Transformer and Android. 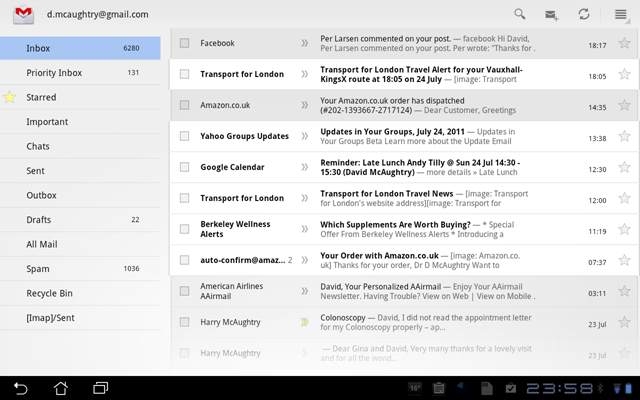 Not surprisingly, Google’s own apps are implemented better on Android than on IOS, and email is a great example. 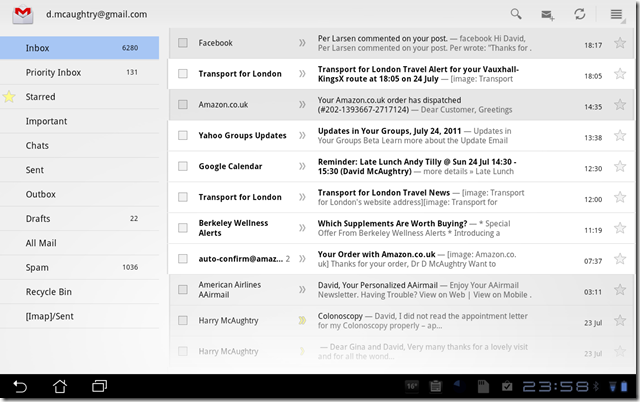 Here’s a screen shot of the Gmail client. While it superficially looks the same as on the iPad, there are some crucial differences. 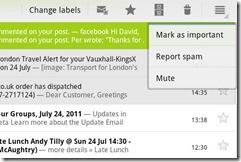 Firstly the priority inbox is supported, so large amounts of semi-spam can be eliminated from your view (e.y.h.o.a). Secondly, and for me, most importantly, the essential mail search function is there, accessed via the magnifying glass icon on the right hand part of the menu bar (e.y.h.o.a). 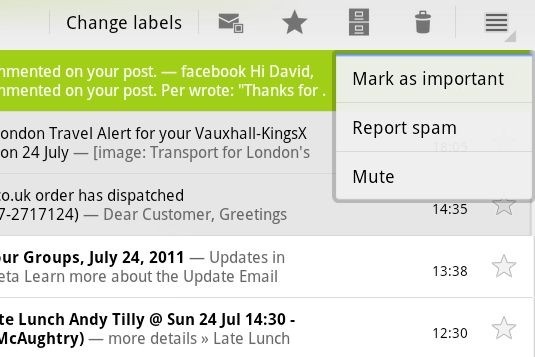 Also, labels are supported, and you can identify mail as spam (e.y.h.o.a). Finally, in search and when composing a new email, the mail client offers suggestions for the email address from the contact list. That’s pretty much every function you need from a Gmail client, and for me it serves as a complete replacement for the desktop. The second major app is Maps, with it’s useful business-finding adjunct, Locations. 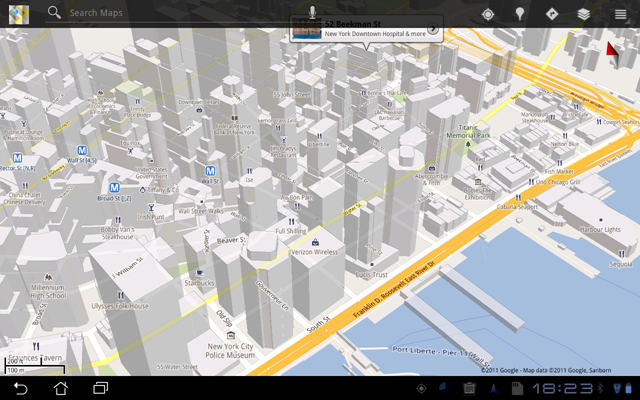 Again the Android version is far superior to the IOS one. 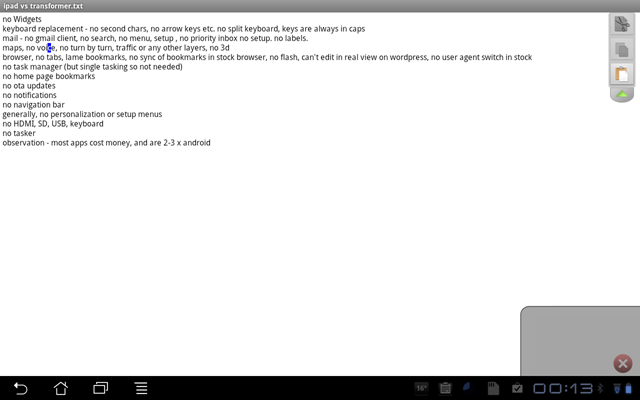 Here’s a screen shot, showing menu options not available on IOS. The critical element on offer here is Layers, showing current traffic, public transport routes, contour mapping and a bunch of other function (e.y.h.o.a). Also exclusively on Android Maps is the voice driven turn-by-turn navigation feature (e.y.h.o.a), less immediately useful on a tablet than on a phone, but still very handy. 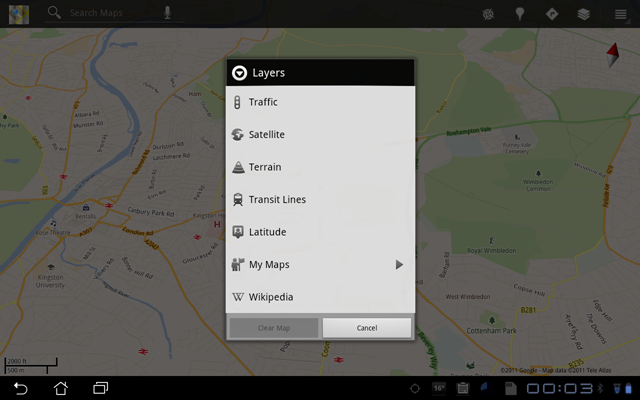 Maps on Android largely removes the requirement for expensive software from the likes of Tom-Tom. The latest version has the ability to download map areas and store them in cache, so you can then run off-line (e.y.h.o.a), just like Tom-Tom. 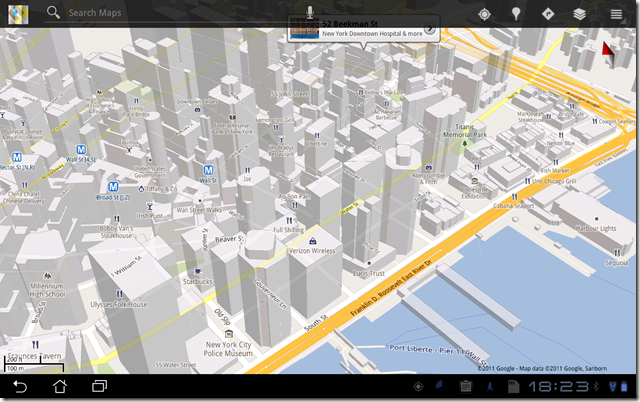 I will show one final exclusive Android maps feature, just because its so cool – and that is the wonderful 3D view (e.y.h.o.a), sadly still not available for London, but working for 100+ other cities (most in US, but many in Europe also). 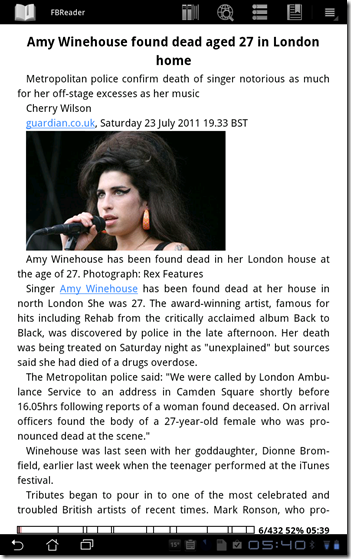 Reading text on Android is a very pleasant experience, albeit one which is not differentiated much from that on the iPad. I currently use the Kindle reader for novels, due to the troublingly easy ability to buy and download books from Amazon. I have to say I also like the look of the bookshelf for the apps, as shown below. 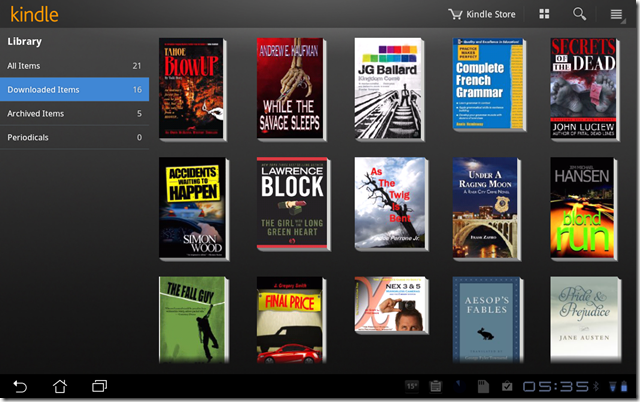 Note – correction as of 3/8/2011:- Apple have now forced Amazon to drop direct purchase of Amazon books via their app, due to their grasping aim of getting 30% of the value of all sales from the platform. If you want to buy an Amazon book you now have to go separately, via the browser. So score one again for Android. I have a large collection of ePub format books and manuals from my Sony eReader (now only used on treks where no power supply is available for days on end). I read these and newspapers downloaded from my Calibre PC app with the excellent FB reader. This has by far the best formatting and user interface of all the ePub readers I have tried on Android, and renders the Guardian very nicely, as shown below. Finally, for fast flicking through .pdf eBooks – in particular user manuals and guides, I use the Ez-PDF reader, shown below with the manual for my new Fuji F900 EXR camera (to be covered in an upcoming ‘on Portability’ series on cameras). This app has the critical things I need, like instant access to a Table of Contents, miniature page views, fast page access, text reflow and fast resizing and so on. It is waaayyyy better than Adobe on a PC, and just by itself is a very good reason for buying a tablet. OK, what of apps for writing? Well the Transformer comes with an MS office compatible suite called Polaris – which is the only app that I can find which supports the Dock Keypad’s Home and End keys. 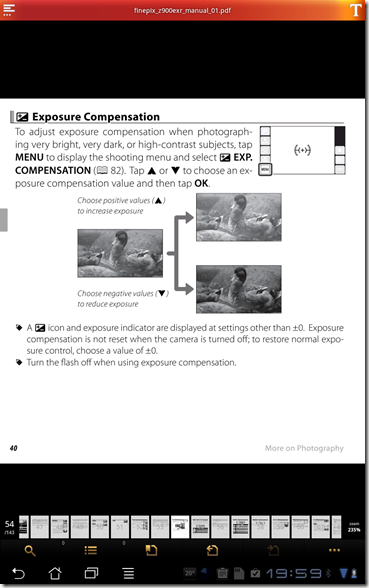 If you use MS Office a lot, this will be very useful. 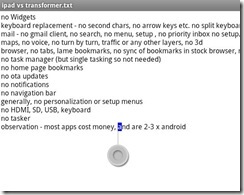 One limitation however, is that it inexplicably does not support the system clipboard function, so you cannot transfer text to other Android apps (like WordPress). That single problem renders it useless for me, but it may not be so much of a issue for others. I notice that Polaris also came installed on my new HTC Sensation, so maybe it will be the new office standard for Android tablets. A very promising app indeed (which does support the system clipboard, and the Thumb keyboard Home and End keys) is Text Warrior – still in early development mode, but already very interesting. Among other things Text Warrior is trying to address the key editing issue in tablets (or phones for that matter) of text selection, cut and paste. It is doing this by providing 4 alternate methods of text selection. The first is the regular method of stabbing your blunt finger, usually ineffectually on the screen. The second provides a large handle for selecting text – much easier to manipulate than the little wedges of Android or IOS. The third– which is a possible de facto method for all tablets, is to provide a soft touchpad in the corner of the screen – shown below in the bottom right corner of the screen. This works really well, unlike the fourth method, which, if I could get it to work, would move the cursor by tilting the screen (an approach I fear that is doomed to failure). Unfortunately, at present other limitations of the software – such as the absence of word-wrap – stop it from reaching the big-time. However, word-wrap is promised for version 1.0, and in the mean-time, I am keeping this installed, and watching for updates. 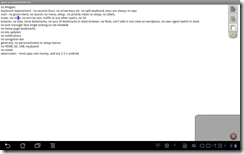 So that’s two apps that are not the complete answer for text editing – so what is it that I do use? My favourite text app of the moment is SilverEdit . This can edit text, .html, .xml, .php files amongst others, and provides a nice straightforward interface, with built-in program support for those languages. It isn’t shown here as a picture of a page of text is not wildly interesting, and html support may not be high on your list of priorities. Good as it is, or may be in the future, SilverEdit is not the full answer, and I am fully prepared to accept there may be a better alternative in the IOS world, or coming along soon in the Android one. One other key area is messaging – i.e. Skype, MSN messenger and the like. Skype is disappointing on both Android and IOS/iPad. Skype on the Transformer is a full-screen app, but does not yet implement the camera (although it does on selected phones, so is coming they say), and as a result no video-call function is possible. On the iPad Skype is pretty lame, as the app is only iPhone size. Although video is available, it’s a disappointing experience. In it’s own very irritating way, Apple has the best solution, with the excellent Facetime application, but as it only works on Apple devices, it’s useless for most two-way calls, which for me at least, will have at least one party on an non-Apple device. One final alternative is the Yahoo messaging offering, which has video, and works on all platforms, but is buggy and slow. So pretty much a blank for video then, but text chat and VoIP calls work just fine on Skype on Android, and the rest will be along soon. It’s only fair to say btw, that the new Skype for iPad app is about to be released. This may put the iPad ahead – albeit for a function I rarely use. To round up a few other useful functions/apps that are again superior on Android tablets, let’s first turn to voice commands, or ‘voice action’ as Google calls it. This extremely effective function allows SMS, email, directions, Google searches, and many other to be executed by voice (e.y.h.o.a). While not particularly useful in the reading room of the British museum, it really works well in more private situations. I have not yet figured out how to show this function in a photograph. Finally, I’ll close with one of the characteristic features of the Android home page – Widgets. For those who are new to Android, or to tablets, these interactive icons provide either independent live function, or informational updates on running programs. As opposed to the actual and rather dull widgets I use (for things like unread Gmail count and so on), for the first and only time in this post string, I am showing a fantasy page of (real) widgets below. All of these can change content- some as fast as every few seconds – to provide continually changing home page information (e.y.h.o.a). This function is not (yet at least) available in the iPad – and the lack of multi-tasking makes it pretty irrelevant until that arrives. 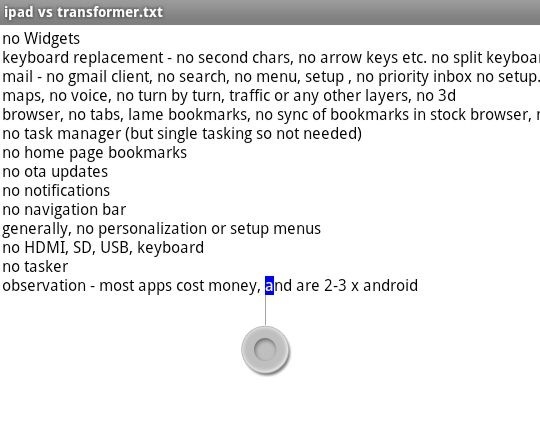 OK, that’s it for the main software and functionality I use on the Transformer. As you can see, there is a great deal of stuff listed above that is superior to, or not available on the iPad. But even this list is not exhaustive. Some of the most powerful Android capabilities, like phone tethering, or the excellent Tasker system management applet builder are not mentioned at all here. I’ll cover many of these in a later post on the HTC Sensation Android smart phone. As far as the Transformer is concerned, I’ll wrap this series up in the next post with a look at security, accessories, and finally which model you should buy if you are thinking of getting one of these great tablets. Also, in the previous post, use the Alt + Tab on the keyboard to bring up the task list. Awesome. Thanks for your great articles. Great tip Glen. And appreciate the nice comment. With the latest updates, Polaris now supports pasting from other apps. It lost it after the 3.1 update. Glen, very helpful, I tried it and you are right! certainly improves Polaris as an editor, although it still does not seem to be able to edit .txt files. I’ll update the post.